Similar fires seen by a Reuters reporter last week in the nation's farm states of Haryana and neighbouring Punjab suggest that efforts by authorities to stave off a massive spike in pollution in nearby New Delhi in the next few weeks may fail. The World Health Organisation said earlier this year India was home to the world's 14 most polluted cities, with Delhi ranked the sixth most polluted. As pollution levels climbed to 12 times the recommended limit and the Indian Medical Association declared a public health emergency in the capital last year, Delhi Chief Minister Arvind Kejriwal called the city a "gas chamber." On Friday, he warned the city may face the same fate this year because of the unrestrained stubble burning. Gurkirat Kirpal Singh, a spokesman for the Haryana government said the state administration had formed a committee of senior officials which was working to ensure that incidents of stubble burning drastically come down this year. He did not elaborate. An official at the prime minister's office, which is coordinating efforts to bring down pollution in the capital, declined comment. 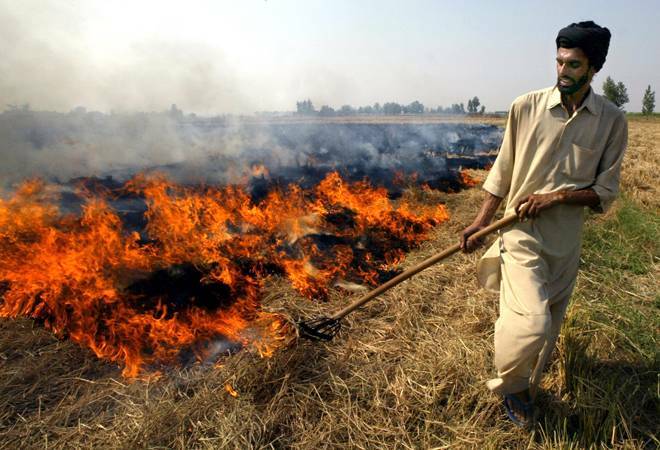 After last year's crisis, the Indian government introduced some measures aimed at curbing the crop fires, in particular offering to pay up to 80 percent of certain farm equipment, such as a Straw Management System (SMS) that attaches to a harvester and shreds the residue. The only problem is that 14 farmers Reuters spoke to on a visit last week to six villages in the rice and wheat growing areas of Haryana and Punjab, said the plan wasn't working. They say that was largely because the subsidy for SMS and mulching machines wasn't covering the costs of the equipment and the labour involved. It was still much cheaper and easier to burn the residue. "Farmers know about the repercussions of burning crop stubble and that's why you won't come across a single farmer who really wants to continue with the practice," said Hardev Singh, 58, who grows rice and wheat in the village of Shahjahanpur, which is part of Haryana's Karnal district. "The fact that government officials want us to use expensive machines like SMS clearly shows that they are far removed from reality," said Sandeep Pannu, who leases his farms to small growers in Phulak village in Haryana state. The message from Haryana and Punjab could be disconcerting for the government of Prime Minister Narendra Modi, whose office has been actively involved in framing policies and taking initiatives to help avoid the repeat of last year's dangerous spike in pollution levels. "The message from the top office is to take steps to avoid the repeat of 2017. Otherwise heads will roll," said a senior Indian government official who declined to be identified in line with government policy. "We'll also ensure that no one gets to burn dry leaves, garbage and other solid waste and we'll see to it that all construction sites get covered," he said, conceding that the first two weeks of November, when crop residue burning peaks, would be critical. That is also when India's majority Hindu community will celebrate the Diwali festival, traditionally ushered in with the setting off of firecrackers. Last year, the Supreme Court banned the sale of fireworks in the capital until after Diwali, but many residents bought them in neighbouring states. "What is happening right now is that we are looking at the satellite data and we can see a little bit of crop burning which could increase and intensify by the first week of November," said Anumita Roychowdhury, executive director of the New Delhi-based think-tank, the Centre for Science and Environment. Although the National Green Tribunal, India's main environmental court, has banned crop residue burning, the decree rarely gets reinforced. "Let's hope for the best," said the government official. "After taking a number of steps, we're just keeping our fingers crossed." Can eNAM flip Indian farmers' fate?